I recently moved to Germany with my spouse and I started to work in November 2018. We got married before moving to Germany. We have both been assigned tax class IV. In my pay slips of November 2018 and December 2018 the tax class used for tax calculation is class IV. In my employment tax statement for 2018 (Lohnsteuerbescheinigung), it is written that my tax class is IV. In late November 2018, we have requested a tax class change from our tax office (Antrag auf Steuerklassenwechsel bei Ehegatten/Lebenspartnern) with this option 'The change of the tax code combination in line 18 should apply retroactively from the month of marriage. / Die Änderung der Steuerklassenkombination in Zeile 18 soll rückwirkend ab dem Monat der Heirat gelten.'. The tax office accepted our request and we have been assigned tax class III myself and tax class V for my wife. I have received the confirmation from my employer that starting from January 2019, the tax class used for tax calculation will be class III. Also, My employer informed me that there will be no correction for the last year and that I need to handle this by my own while filling my income tax return (Einkommenssteuererklärung). Should I fill my tax return the tax class from my employment tax statement for 2018 (IV) or should I fill the tax class which is currently assigned to me (III)? How can I specify that I have changed my tax class from IV to III? How will the reimbursement be effective and when? Please fill in your current tax class. Basically, the tax class is only important for the calculation of the monthly wage tax that is paid by your employer to the tax authorities. For the calculation of income tax the tax class is irrelevant and is only being presented for information. The amount of the actual tax liability is calculated from the taxable income that is determined by the income tax return (income minus expenses, such as work-related expenses). By filling the tax return form on SteuerGo, tax authorities will class you correctly according to your marital status, children etc. The "Lohnsteuerbescheinigung" (certificate of wage tax deduction), which is issued by your employer, reports the paid wage tax. Financial authorities will correct and refund you. A possible reimbursement will be paid by the tax office according to your assessment. Usually you will receive a reimbursement within 1-14 days after you received your tax assessment. The processing of a tax return at the tax office takes around 6 weeks, but may last 2-3 month or even longer. To find out about the processing of your individual tax return you may call your reelvant tax office in person. Only they can give you accurate information about this matter. Do you have any comments regarding their reply? The ones I have seen ask you to fill in the information given on your Lohnsteuerbescheinigung. Thus, fill in the income tax class exactly as stated on the form you got from your employer. Tax classes are used only to calculate the amount of taxes your employer downpays on your behalf - correct/"better" class leads to these predictions more closely matching the final tax calculation based on your income tax declaration. They don't influence the final amount of taxes you have to pay (i.e. the amount of taxes due is the same whether you had IV/IV or III/V deductions). Last but not least, if you worked 10 months outside Germany and 2 months in Germany, the tax deductions may anyways be totally off unless the German-taxable-equivalent of your outside-Germany wages are very similar to the German wages you get. This sheet basically lists how much taxes you have to pay and how much of that has already been paid. That's where the downpayments your employer collected on behalf of the tax office appear (line 2). These downpayments differ depending on the tax class. So the result is that if your employer withheld according to class IV instead of III, your reimbursement will be higher by exactly this amount of money. In the class IV example, your employer withheld 1451,14 € vs. 806,70 € with class III (difference 644,44 €) and you get back 1118,81 € vs. 474,37 € (difference 644,44 €). On your tax return for 2018 you must specify the tax class you had in 2018, that is IV. Your change in january 2019 is not relevant for the 2018 return. Daniel is right that you might want to consult a professional about whether to file jointly. There is also tax software that can help you in this decision. Not the answer you're looking for? 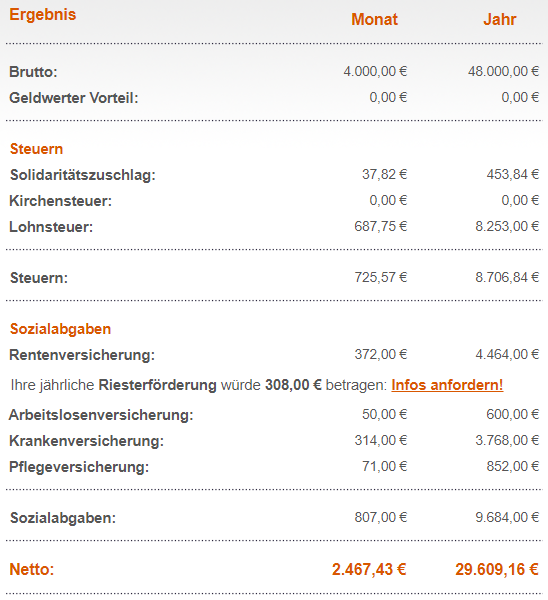 Browse other questions tagged income-tax germany income-tax-refund or ask your own question. 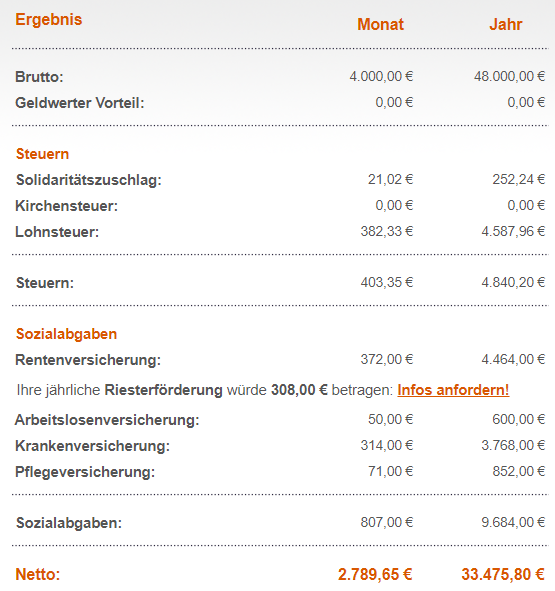 Income tax return for 2013 in Germany - how to? Tax class change in Germany? What conditions should we fullfill to pay taxes as a family?